This state was born during the American Civil War of the 1860s when it broke with the state of Virginia over that state’s attitude with seceding with the federal Union. For decades the lands of West Virginia were that of the colony and then state of Virginia. During the late 1600s and early 1700s various English explorers had gone into the western portion of Virginia. By 1725, a large group of German settlers from Pennsylvania founded New Mecklenburg along the Potomac River. Many settlers crossed the mountains after 1750, though they were hindered by Native Indian resistance. Few Indians lived permanently within the present limits of the state, but the region was a common hunting ground, crossed by many trails. The populations settling in the western region were all very different. 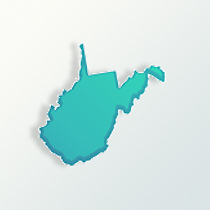 For West Virginia genealogy purposes, part of the immigration came by way of Pennsylvania and included Germans, Protestant Scots and settlers from the states farther north, like Connecticut and New York. Many people thought in the 1770s that the region should be separated because of the Alleghenies dividing the region. The conflict between the east and western sides continued in the 1800s. When Virginia seduced from the Union in 1861, the citizens of what would become West Virginia knew they wanted no part of the Confederacy. By June 1863, West Virginia was approved and admitted for statehood. During the Civil War, West Virginia only suffered under bands of guerrillas who burned and plundered in some sections, and were not entirely suppressed until after the war ended. In the 1870 and 1880s mining became very important. Saltpeter caves were located along with limestone caverns which had calcium nitrate. The best resource found was bituminous coal which was needed for steamships and for factories. Using the railroad system, large qualities of the coal could be transported across the states. With the new minerals and resources discovered new immigrates came to West Virginia. The population in 1860 was 376,600. In 1900 with was 762,800 and in 1910 reached 1.2 million residents. In the state those of English and Scots-Irish descent make up 40 percent of the population. These represent high numbers in West Virginia genealogy. The Germans are at 17 percent and Irish at 8 percent of the state’s population. Those with German heritage live mostly in the northeastern section of the state. The English are spread throughout the state. In West Virginia the African-Americans make up 3.5 percent of the state and Hispanics are less than 1 percent. The Protestant religions represent 60 percent of the population, due to the high number of German, English and Scots-Irish descendants and only 8 percent are Roman Catholics.